...a great opportunity to introduce them, through your memories, to inspire others. Your words of encouragement to those who are currently challenged by their relationship with their living Father, Mother or loved one can be put into perspective by your shared memories. We can build a lasting legacy, as a tribute to the loved one(s) we have lost, through the nearly lost art of sharing our treasured memories with our children and grandchildren. Try turning off the computer or TV and instead share a memory with the next generation in your life. Book Endorsement by Oliver Young (Yang Hanfeng) of "Our Fathers Who Art In Heaven"
A Quote To Reflect On Your Outlook of Life From the Founder of the "Our Fathers Who Art In Heaven Foundation"
"Rejected stones are thrown afar but enough of those stones can create a bridge to go farther than you have ever been before." How are you looking at rejection in your life? Book Endorsement by Bud Gardner of "Our Fathers Who Art in Heaven"
Everyone gets cold feet once in a while, especially in the Northern United States. My cold feet have nothing to do with the weather or poor circulation. According to my doctor, it has everything to do with heredity. I started thinking about it, when my Father was alive, he always had cold feet. My Mother always used to say to my Father, "Cold feet - warm heart". 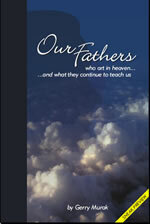 Book Endorsement by Yvonne Divita of "Our Fathers Who Art In Heaven"
"Fathers are the carpenters of the soul. This book reveals that better than any other written to date. Read it and add another room to store memories in your soul." Yvonne Divita, President and Founder, Windsor Media Enterprises & WME Books. Did you ever have a meal full of memories? Tonight we took my Mother out to dinner to a family style restaurant. Since she had her by-pass surgery last summer, she has been feeling a lot better and her appetite is back. It is great to see her enjoy dining out. Barb had some baby ribs and she asked my Mother if she would like one. My Mom smiled and said, "Are you sure you don't mind?". Being brought up during the Great Depression, my Mother and now deceased Father never left any meat on the bone. Tonight was no exception. Over seventy years later, my Mother still treats every bit of food as a valued experience. It reminded me of my Father, who art in heaven. Until the day he died, not even the smallest scrap of food was ever wasted. If we had a pet dog or cat as a kid, they were never given any store purchased pet food. At the end of a meal they were given whatever bone, grizzle or sausage casing may be left from a meal. Then, near the end of tonight's dinner, my Mother said she was was full but still had food left on here plate. It went without saying, that I needed to ask the waitress for a take home package or as we used to call them years ago - a "doggy bag". There was a little red wine left in my Mom's glass. I looked at her and asked if she would like me to pour it on the meat in her take home package. She didn't answer me right away and then she said, "You probably don't remember, but your Father used to do the same thing when we had leftovers at a restaurant". Nothing was ever wasted during my parents childhood or their adulthood. My Mother was 85 last year and she still doesn't waste any food. I wonder what my late Father would think if he saw all of the perfectly edible food that gets thrown out in this country today. It would be very hard for him to accept the amount of food that people waste today. It was always one of my Father's greatest fears, a generation that didn't know what an economic depression was like to live through. For my Mother and Father every meal was appreciated and memorable. Tonight's dinner was certainly full of flavor-able and favorable memories. Thanks Mom and Dad for teaching me the value of a meal that so often gets taken for granted. Book Endorsement by John Gray, Ph.D. of "Our Fathers Who Art In Heaven"
"Our Fathers Who Art in Heaven" is a source of inspiration for anyone who has lost their father." John Gray, Ph.D., author of "Men Are from Mars, Women Are from Venus"
"A sponge that is full of water can take on more, once it is given the chance to dry out or if you allow someone to squeeze it just a little bit." 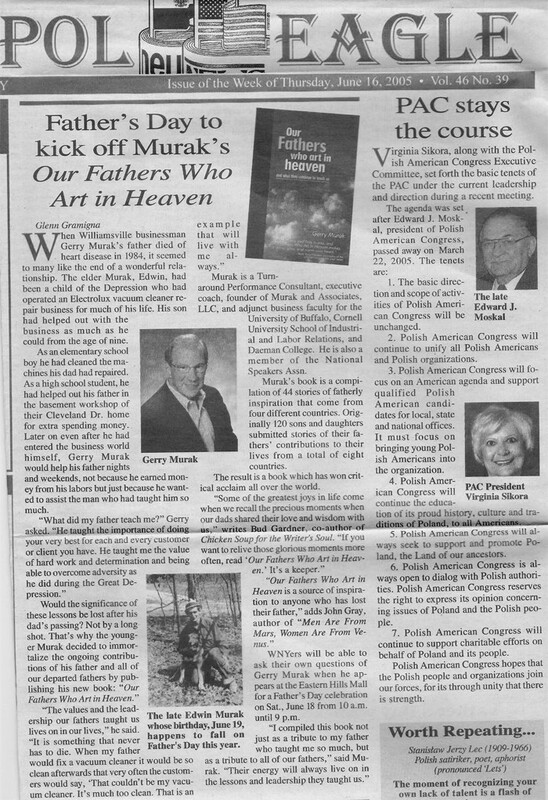 Gerry Murak, Founder of the "Our Fathers Who Art In Heaven Foundation" - www.OFWAIHF.org, creator of the "Who Art In Heaven" book series and the first in the "Who Art In Heaven" book series - "Our Fathers Who Art In Heaven". If it seems like you can not take on any more after the loss of a loved one, at least allow someone else to help. Professional help is always available. You are not alone, just ask your doctor. If you or someone you know experiences the loss of a Father their is hope. The hope is to see others benefit from the life lessons you learned from your Father. When the time is right, share those memories with others so they can benefit from a Father's love, wisdom and experience.